Are you constantly tired? Do you struggle to get through the basics of your day? 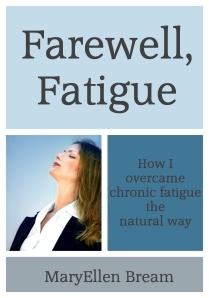 Learn how I overcame chronic fatigue naturally! After a year and a half of struggling with fatigue and other miserable symptoms for no explainable reason, I was finally diagnosed with Chronic Fatigue Syndrome. I immediately began a quest to find the information I needed to overcome it with nothing other than completely natural methods. Today I have made a complete turnaround from the way I used to feel. Although I spent thousands of dollars to learn from naturally minded doctors, I want to share with you what I have learned for just the price of an ebook! These natural methods of healing are not spooky or strange, but are lifestyle changes that anyone can implement. Although I was already leading a fairly healthy lifestyle before ever being diagnosed with Chronic Fatigue, there were a few pieces of the puzzle that were missing. I have attempted to share ALL of the puzzle pieces that fit together for me so that you can attempt to piece them together in your own life! Purchase the ebook and learn from my experience! Interested in becoming an affiliate and earning money for recommending this book to others? Sign up here!